It rained heavily during the night and part of the garden flooded; the part where the water in the basement pumps out. It's a good thing the sump pump works well, but the high water level at the corner of Strawberry Fields reinforces the need to create a rain garden there. I made a start on this venture by researching plants for a rain garden and making a couple of purchases. 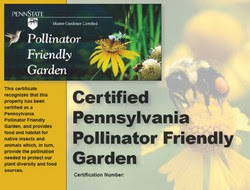 Before I do too much more, I plan on attending some upcoming master gardener classes on the topic. 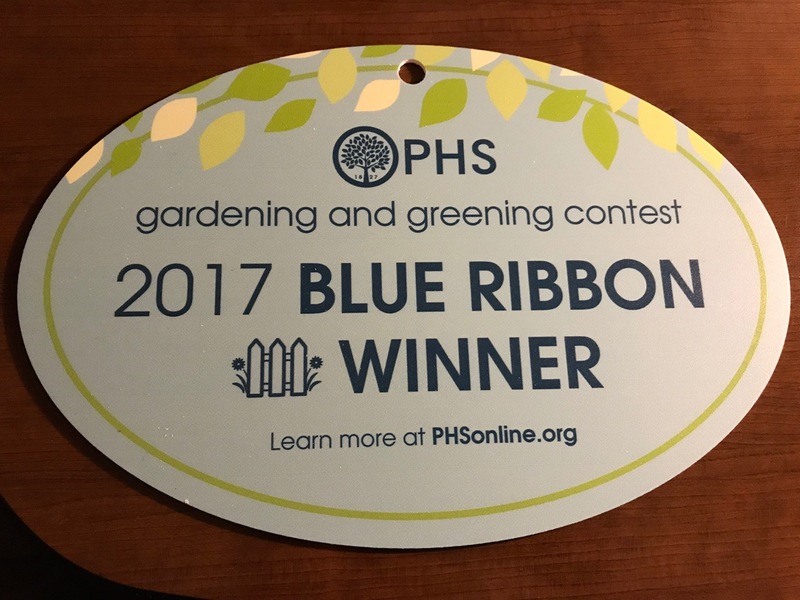 That's one of the joys of gardening: there's always something new to learn. One thing I know, I must move the stand of phlox that doesn't like wet feet: No wonder powdery mildew attacks them every year. 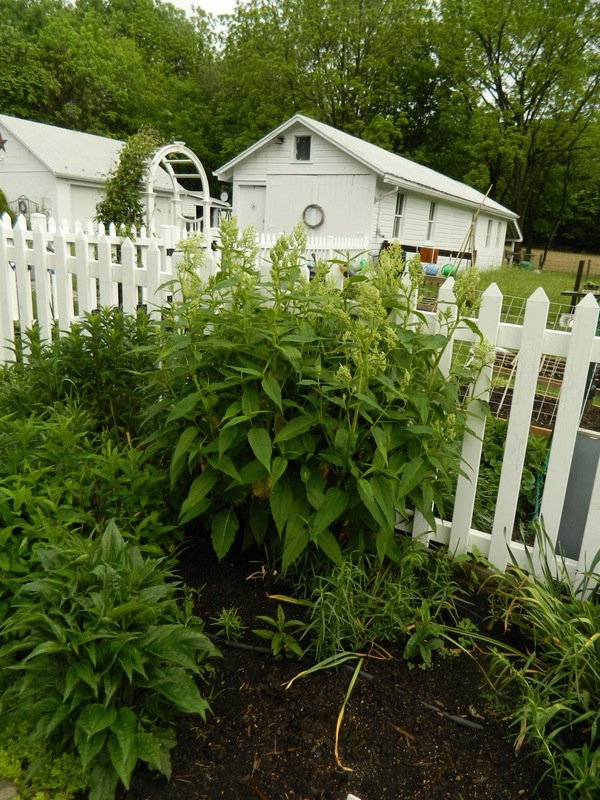 Joe Pye Weed is on my list of rain-garden plants. I tried growing it from seed but had no luck. I'm glad I purchased one of these 'native' beauties. Ironically, it's too wet to plant anything today. 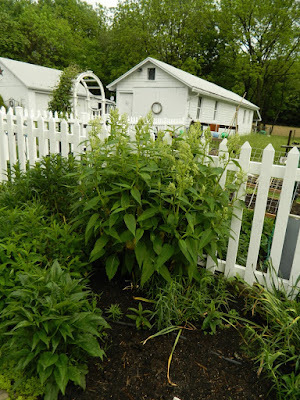 Joe Pye Weed (in the blue pot) waiting to be planted in the rain garden. 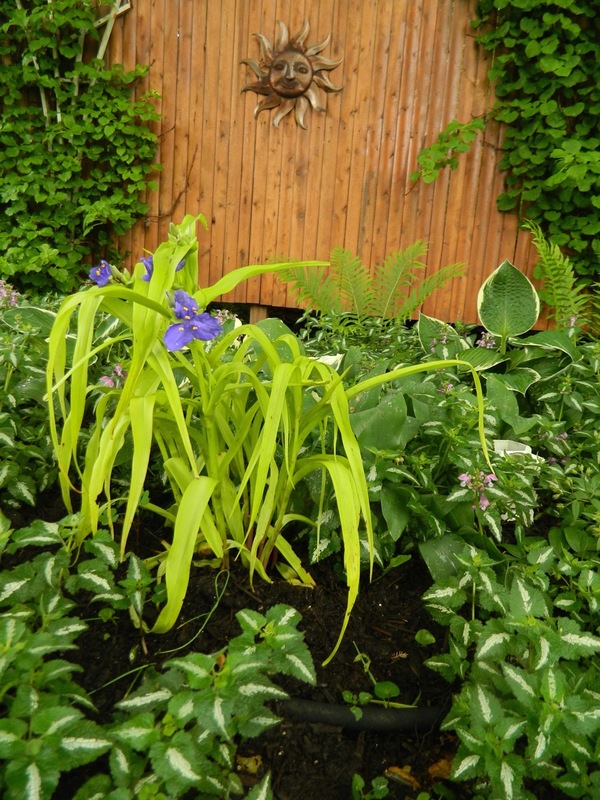 Near the rain garden, in a less wet area, Goat's Beard is shooting up. I love this giant astilbe-like plant. In the bare earth that you can see in front of Goat's Beard I sowed wild lupine seeds that my friend, Katharine, gave me. I do hope they germinate, but it seems we have an enormous number of sparrows nesting here this year, and I suspect they are checking out all my seeds. I covered the beans and red beets with row covers to prevent the birds from eating the seeds. I'm glad to see some of the bush beans made it. I'm not so sure about the beets. 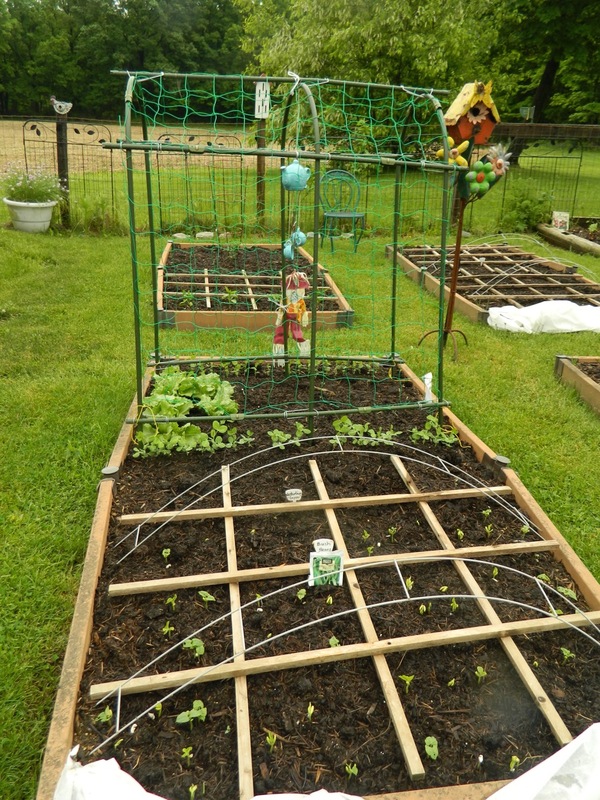 Bushbeans, snow peas and lettuce. 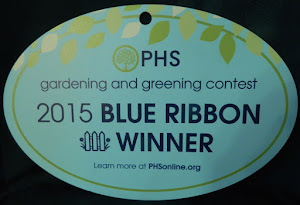 By June I've often harvested all the cool-season crops like lettuce, but I was late planting this year. In last week's extreme heat I shaded them from the hot sun for several hours each day. They are almost ready to harvest. Some fresh healthy salads in the making. 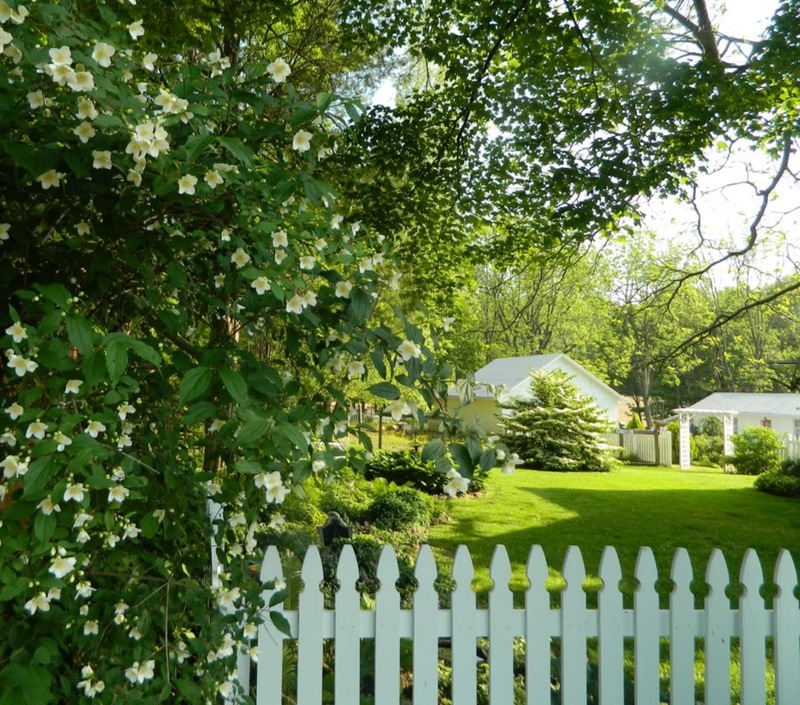 Let's take a walk around the garden and see what else is blooming today. 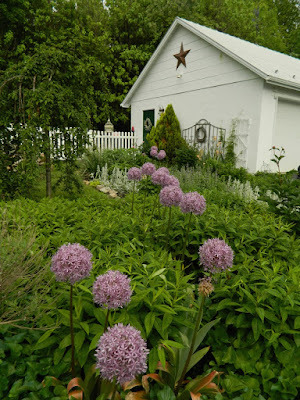 I took a similar picture of Allium 'Globe Master' last May. I see there are more blooms this year. 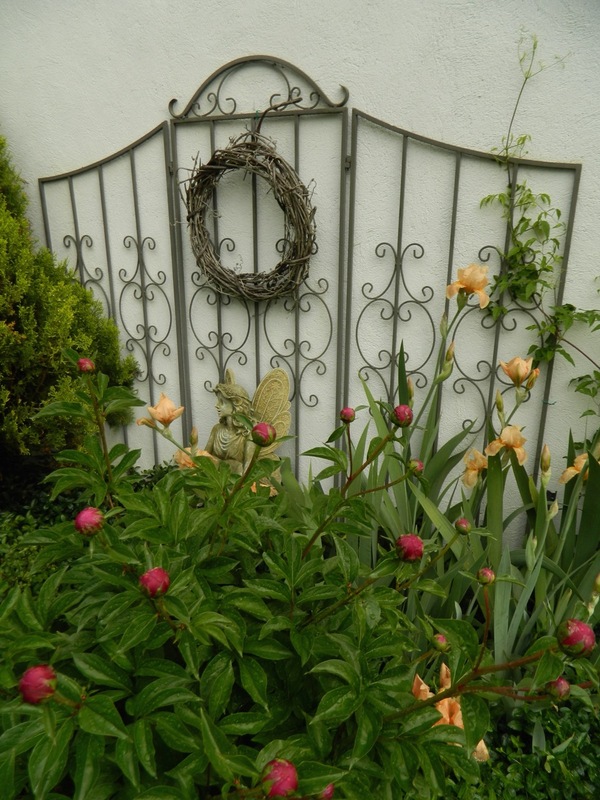 Peach irises in bloom and red peonies about to pop. 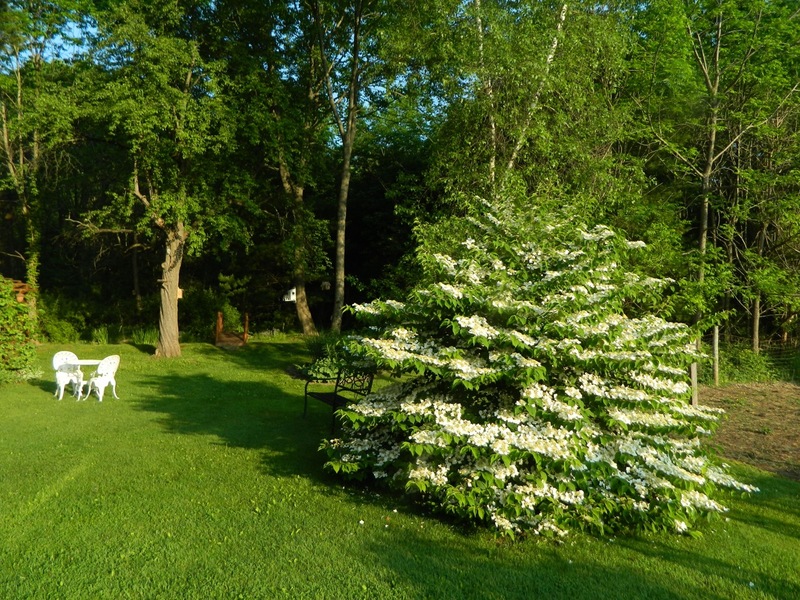 The viburnum stole the May show. 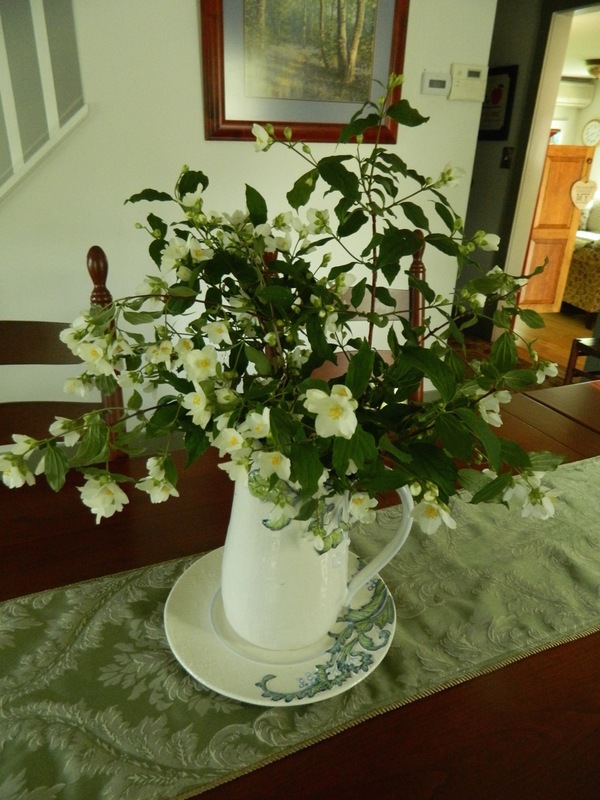 The flowers are arranged horizontally along the branches -- very striking. Must say this is one of my favorite shrubs. As the vibermum blooms fade, the mock orange comes into its own. 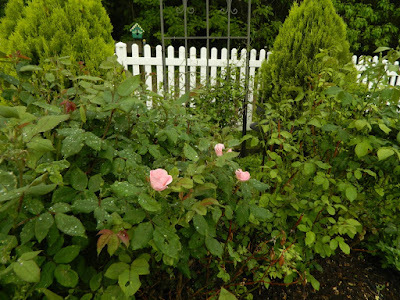 I featured it in the first picture of this posting, growing at the corner of the picket fence at the front of the house. 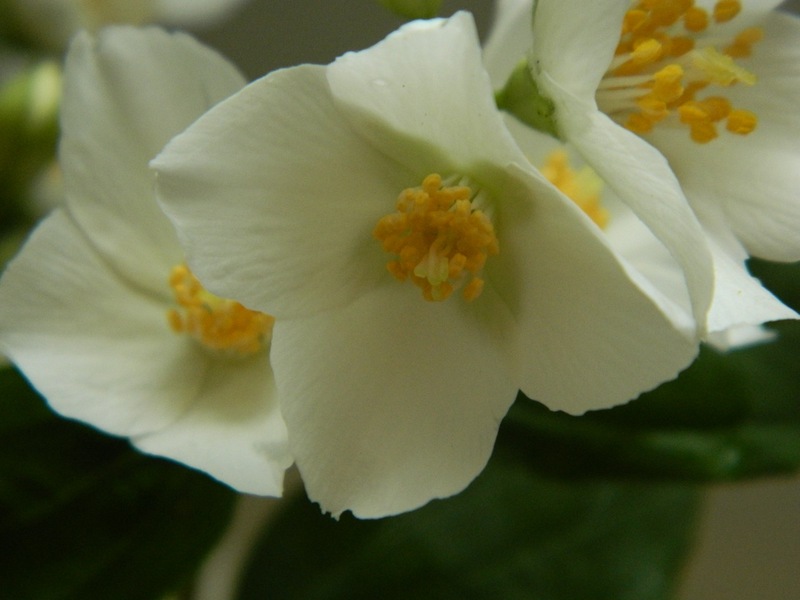 Another favorite, I love it for its pretty flowers, but most of all for its fabulous scent. As always, I brought branches into the house. Mock orange is my choice for June's Dozen for Diana. I'm participation early due to the early blooming of the shrub. 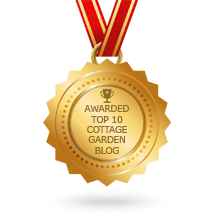 Diana at Elephant's Eye on False Bay in South Africa asks that you choose a 'must have' plant in your garden each month. 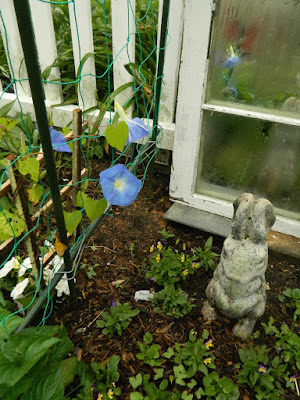 Do go to her wonderful blog -- her May garden is stunning -- and join in the fun! 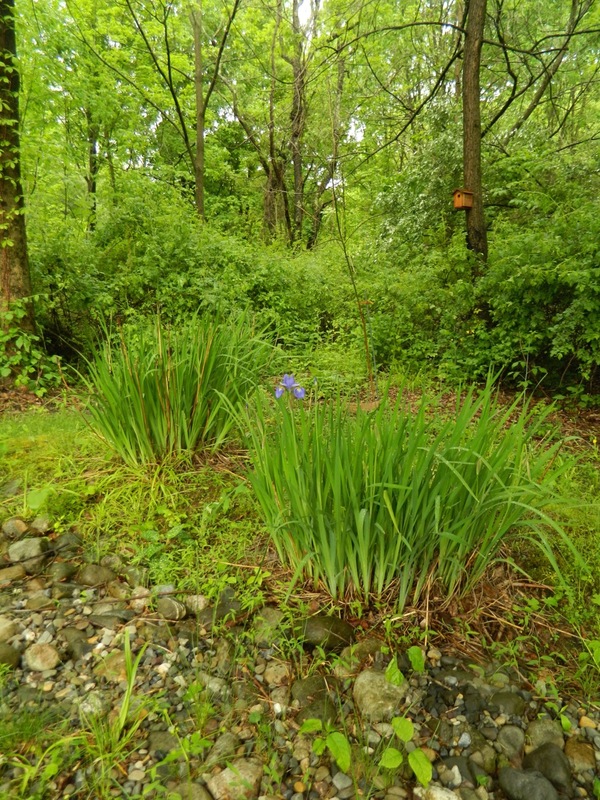 Do you see the first bearded iris flower along Bluebell Creek? 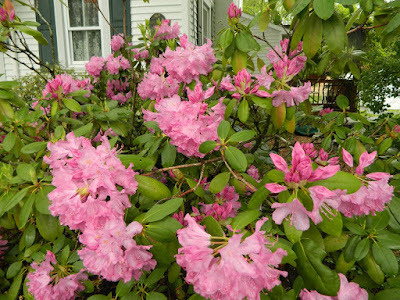 The rain dashed down a lot of plants including the rhododendrum at the front of the house. 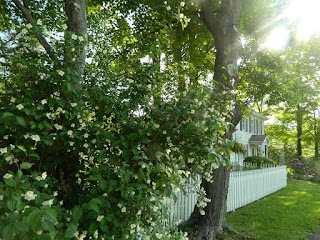 This is another shrub that bloomed early and its blossoms are fading already. Rhododendron 'Roseum Elegans' blossoms dashed down by the rain. 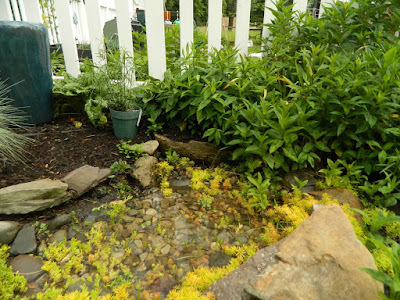 While many parts of the US are being deluged by relentless, devastating storms with tornadoes and flooding, Pennsylvania welcomed the rain after an unusually hot, dry May. This morning was a little misty; the air felt good after the rain. nascent waiting skies after rain. 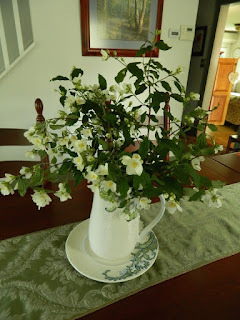 I enjoyed looking back at my May blog postings of the last several years to see how each year is different in some way: weather, temperature, plants blooming at different times. The difference, a yearly phenomenon, makes gardening so interesting. I hope your May was wonderful! Calibrachoa on the front porch. I wish May would last forever, just go on and on. The garden feels so fresh and new in the early morning with its subtle verdant shades and its sweet spring flowers. It draws me outside each dawn to mark the daily changes with my camera. Here are the pictures I took on May 15, the day that garden bloggers around the world celebrate Bloom Day with Carol at May Dreams Gardens. I looked back at previous GBBD pictures and was amazed how many of my shrubs have filled out. That's one of the joys of blogging: every year is different. Along Bluebell Creek the English bluebells are blooming, rekindling memories of springtime walks in the woods of my childhood. Nearby, the pieris shrubs in my Woodland Walk provide color with their flaming May blooms. I recently learned that Pieris is sometimes called Lily-of-the-Valley plant. 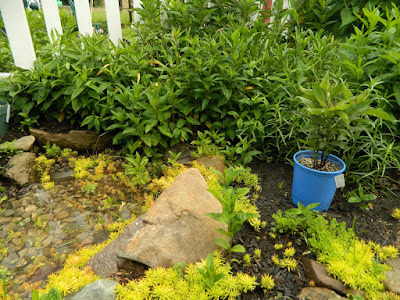 I think that name applies to those pieris with tiny white flowers -- I have that type too. 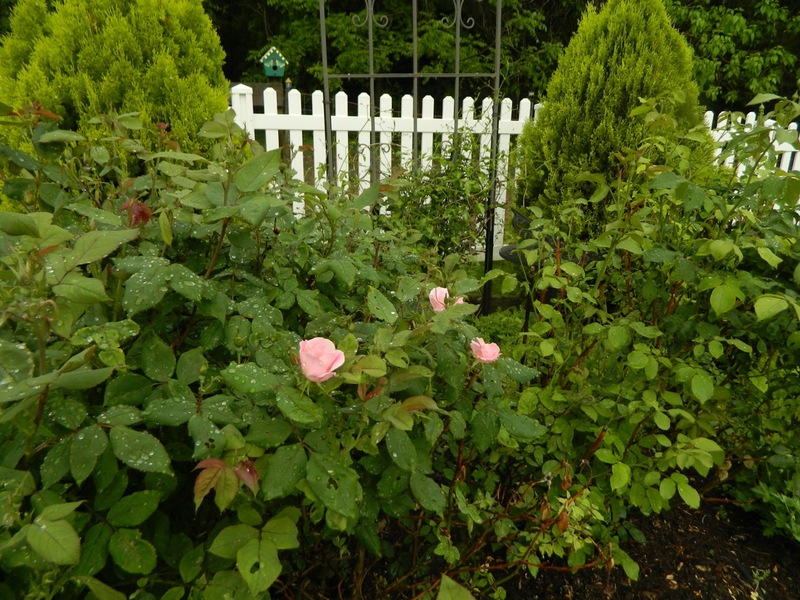 I'm so happy some of the shrubs and flowers I planted here survived the winter and the deer. Speaking of Lily-of-the-Valley, I can see the sweet flower and smell its perfume in the Woodland Walk and several other shady areas. 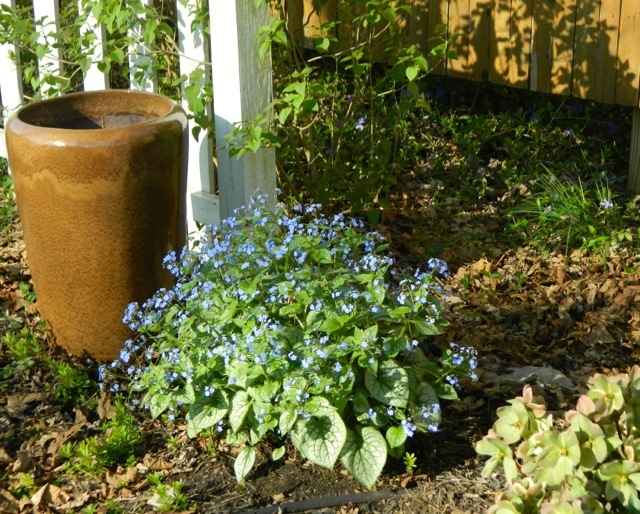 Also, in the Woodland Walk, the newly planted brunnera survived some deer nibbles and put forth its forget-me-not blooms. Brunnera macrophylla -- can't remember which one. 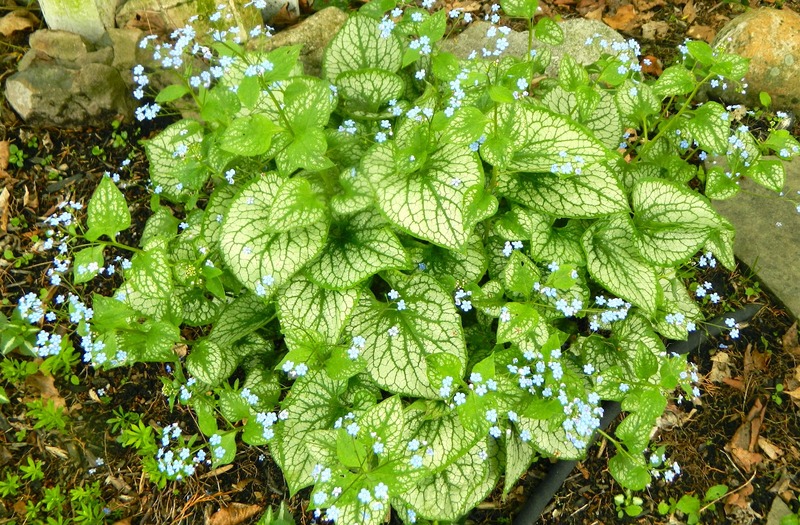 I'm choosing Brunnera as my May plant for Diana's Dozen as I couldn't imagine a shade garden without its beautiful foliage. It's fun to compare my choices with those of Diana in her stunning South African garden. I'm naming the shade garden 'Serenity.' 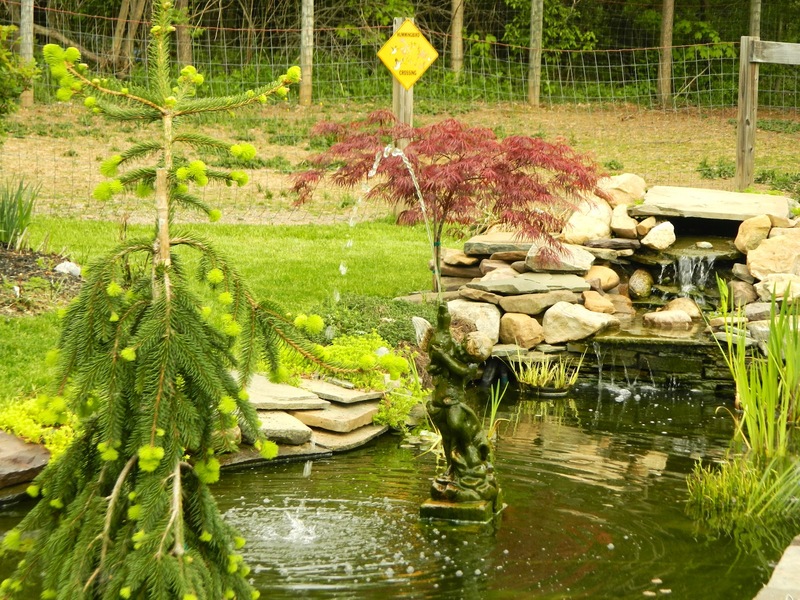 Serenity gardens are often associated with Japanese gardens, but it is the perfect word to describe the way I feel in this space. 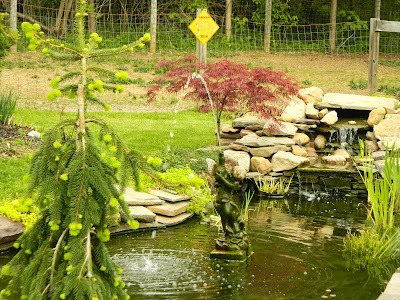 The cottage garden and the pond are filled with spring beauty. The forget-me-nots are everywhere. 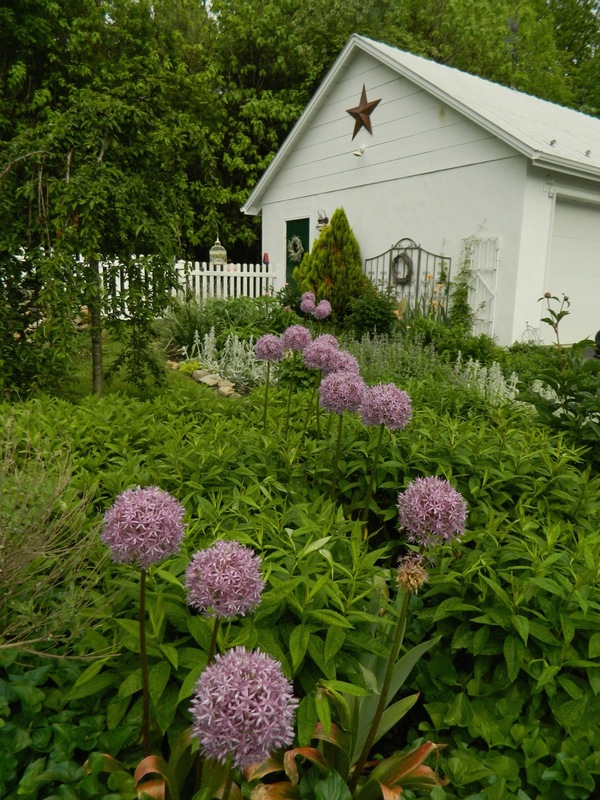 Allium shoots up with buds full of promise. We planted the dwarf cutleaf maple to shade the waterfall from the harsh summer sun. It has reached its glory this year. I can't resist showing how it looked three years ago. 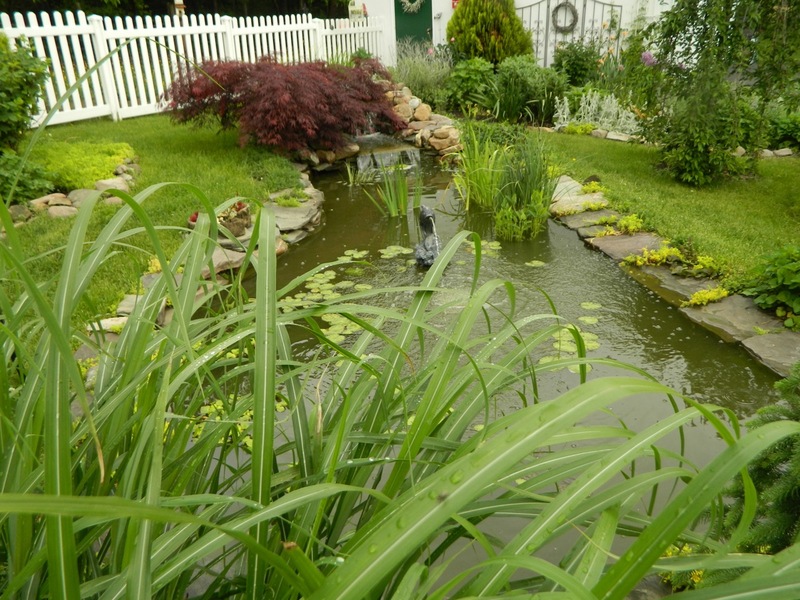 Notice the yellow iris in bloom in the pond. 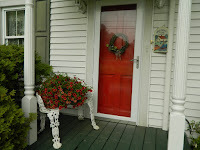 I've started adding annuals in pots to the garden; this hanging basket of calibrachoa was the first. Dude and Billy, along Penny Lane, patiently wait for their breakfast as I continue with my photo shoot. The kitchen garden is ready for me to finish planting. 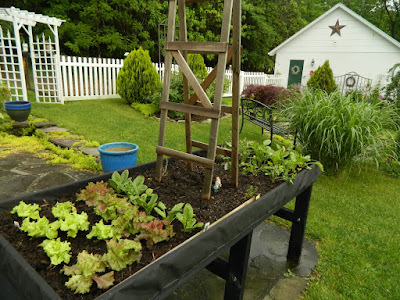 The cool weather crops: lettuce, snowpeas and onions are in. Notice the bottom-left of the picture: the rhubarb went to seed early. I wasn't vigilant and only noticed its blooms when I took this photograph. How did I miss it? No rhubarb pie this year! What a bummer. In the herb garden on the patio I planted more lettuce, also spinach, flat-leaf parsley and Swiss chard. There are rosemary and sage from last year, too. Also, I thing the borage plant is coming back. Strawberries, fuschia and cosmos hardening off on the outside potting bench. Finally, the May 15 view from the den window. I've decided to take a picture from this location on the 15th of every month to mark the changes in my garden. 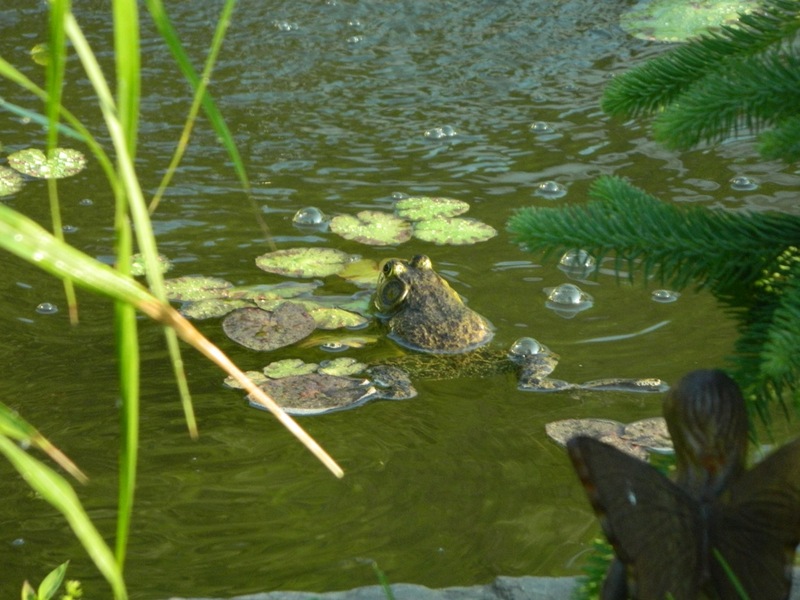 The pond from the den window. As I said, the pictures in this posting were taken several days ago. I'll shoot more before the end of the month to observe the progress. Every day brings changes to my gardens. This is the BEST time of the year!